Presenting statistical data in a readable, eye-catching manner is important, but it can also be difficult. The dojox/charting system was created to alleviate those pains by allowing developers to create dynamic, unique, and functional charts from varying sets of data. In addition, dojox/charting provides numerous themes and chart types to allow developers to display their data any way they'd like. This tutorial will show you how to create basic charts with varying data, plots, axes, and themes. 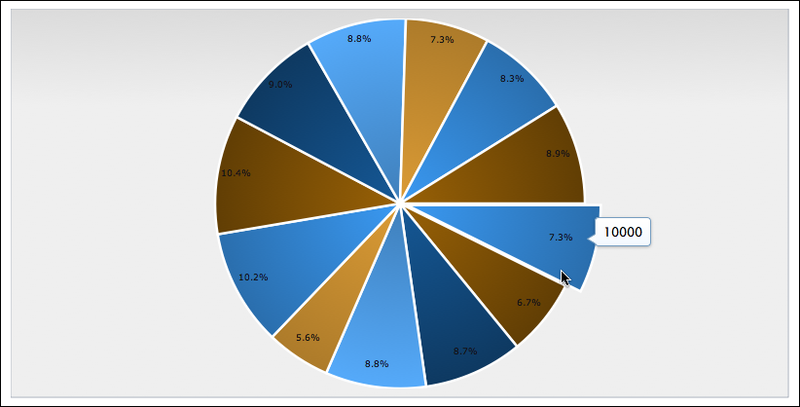 Can render charts in SVG, VML, Silverlight, and Canvas. An effort to allow SVGWeb rendering is also under way. Before creating these wonderful charts, it's important to make chart resources available within the page. Note that in 1.7+, the Chart2D "catch-all" module which loads all axis and plot types is deprecated. It is still available for use, but the preferred approach is to use Chart and include just the axis and plot modules you need. With these minimal dependencies loaded, your application is now empowered to create charts! With declarative chart creation, the main chart settings go within the container node. Plots and series get their own nodes with custom attributes containing chart settings, as would plugins and other chart pieces. Important note: while it's certainly possible to create charts declaratively, it's highly recommended that developers create them programmatically. dojox/charting does not yet fully support the data-dojo attributes introduced in Dojo 1.6+. The code above should give you a basic example of dojox/charting, but there's much more to chart creation than that. Let's dig deeper into dojox/charting and its capabilities. You may use any number of themes on a given page. Want to learn how to create a custom chart theme for your web application? Read Dive Into Dojo Chart Theming. Defining a basic chart and implementing its theme is quite simple. The real work comes in when defining plots, axes, and series. Each piece serves its own distinct, important purpose. Default - Universal line chart capable of rendering lines, fill areas under those lines, and placing markers at data points. This plot type is used if no plot type was specified when adding it to a chart. Lines - Basic line chart. Uses Default. Areas - Area under data line(s) will be filled. Uses Default. Markers - Lines with markers. Uses Default. MarkersOnly - Markers, sans lines. Uses Default. Stacked - Data sets charted in relation to the previous data set. Extension of Default. StackedLines - Stacked data sets using lines. Uses Stacked. StackedAreas - Stacked data sets with filled areas under chart lines. Uses Stacked. ClusteredBars - Horizontal bars with clustered data sets. Uses Bars. StackedBars - Stacked data sets with horizontal bars. Uses Bars. ClusteredColumns - Vertical bars with clustered data sets. Uses Columns. StackedColumns - Stacked data sets with vertical bars. Uses Columns. 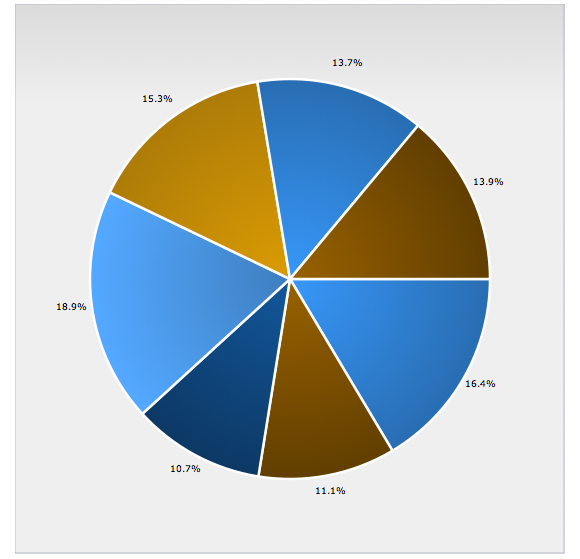 Pie - The traditional pie chart. Scatter - Similar to MarkerOnly, yet capable of charting using gradient fields. Grid - For adding a grid layer to your chart. You can see each chart type in action by visiting Dojo's nightly charting tests. When using dojox/charting/Chart, you need to require each plot-type module you wish to use. x - Similar to "X" but assumes that the point set is closed (a loop). It can be used when plotting true XY data. S - Quadratic bezier lines. Before creating your chart, take the time to visit the dojox/charting Reference Guide to see what special settings and customizations are available for the chart type you'd prefer. vertical: true // y is vertical! You can learn more about an axis' settings including customization of colors, fonts, stepping, and precision in the Dojo reference guide. name - The name of the series. Also represents the series label when the Legend plugin is used. A chart can have any number of overlapping series as the developer would like. With the pieces of dojox/charting defined, it's time to create some basic charts. 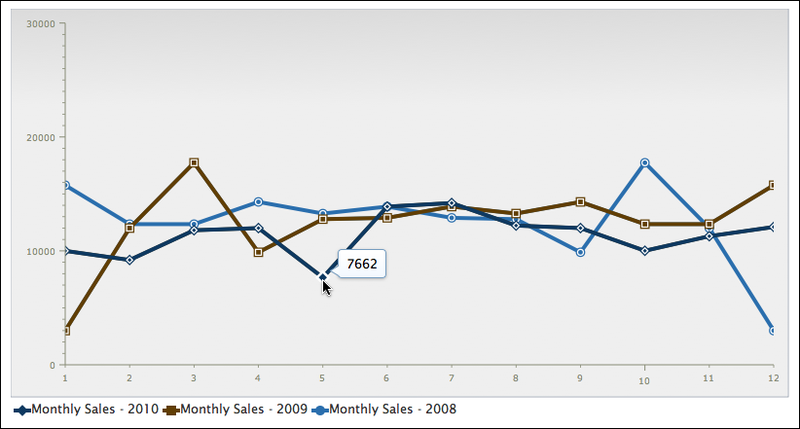 The Monthly Sales chart is a lines chart which features multiple axes and the "Tom" theme. This chart builds on the first chart but adds a second axes to show multiple data sets. This chart also uses the Dollar theme. This chart builds on the original Line chart but instead uses columns. A 5-pixel gap is placed between columns; the MiamiNice theme is used. The dojox/charting library provides functional and aesthetically pleasing plugins to enhance your forms. //this legend is created within an element with a "legend1" ID. Include the Dijit theme of your choice to style your tooltips. Also note that the Tooltip plugin must be assigned to the chart before the render method is called on the chart. Like the Tooltip plugin, the MoveSlice and Magnify plugins must be assigned to the chart before the render method is called on the chart. We are using Tooltips which are based on the Dijit Tooltip, therefore we need to make sure we load a Dijit theme stylesheet. In this example we loaded Claro. The Dojo Toolkit provides a complete charting library capable of creating elegant, eye-catching, and dynamic charts of various types. dojox/charting is unmatched by other charting libraries in flexibility, functionality, and extendability. Don't serve your data to users in a boring way -- dress up your data with dojox/charting!